NSCN –(IM)in a statement hinted apprehensive attitude towards the sincerity of the Indian government in solving the vex Naga issue following the report of one Pradip Deka. The reportage of Pradip Deka (December 19,2018) titled, “no lateral talks with militants, Die fighting or surrender, says Deputy Security Advisor R.N. Ravi” gives an impression that the Indo-Naga political dialogue, as seeking solution within the framework of the Indian Constitution or Union of India. It is an intended negotiation for the political talks and between the GOI and the NSCN, says the MIP of the NSCN-IM. The statement said that the Indo-Naga peace talks have, after years of deliberation following the cease fire declaration in July 1997, made considerable progress: the government of India officially acknowledged and recognized the ‘unique history and situations’. The subsequent Framework Agreement signed and declared on 3rd of August, 2015 is also fundamentally based on the unique history of the Naga people and co-existence through shared sovereignty between the two entities. These are the core principles for bringing about final and lasting solution acceptable to both the parties. It added that the Naga people have suffered long enough, have shed enough blood and lost many precious lives. No part of Naga history at any given point of time has ever been more serious as today or propitious political climate such as today is likely to repeat more often. History reminds mankind; how many lives is a man’s worth that one should gamble over the rights of a nation? Deviating from the honorable “Out of the box” approach towards a hard line position is clearly a deviation from the framework agreement, which is based on the mutual respect and recognition of the two entities as mentioned. Nagas have accepted the honorable way for the concerned parties, but the GOI obviously is treading the path of ‘MACHIAVELLIANISM’. It will be a conscious and deliberate betrayal of the GOI’s position to seek solution without precondition at the highest political level, outside India in a third country and based on the officially recognized unique history and situation of the Nagas. GOI should have the courage and the boldness at this juncture for her larger security interest. If lasting and honorable peace is what she desires she should not drive away the Nagas or those who seek peace. Military solution will surely lead to a fresh epidemic conflict that will cost dearly the lives of both. There is no foundational logic or basis in that approach after 20 plus years of political negotiation. Rhetoric’s, might have their own historical roots. But both the parties have now left behind their classical position and have sought an honorable way out of the conflict. If this environment is not exploited by the GOI then it amounts to deliberate departure from seeking peaceful solution through political negotiation. Political negotiation must not be reduced to seeking political gain of any parties. It amounts to betrayal of the basic principles of the political negotiation and of the 3rd August Framework Agreement, 2015. Wisdom will prevent heartache and bring about honorable solution and permanent peace for both. It is required for both, to honor the moral principles already agreed by both the parties. Manipur Students’ Association Delhi (MSAD) in a statement said that a team of Manipur Police had come at the residence of its General secretary Javed Mehedi at Keinou. The police came to nab the leader of MSAD, the statement added. The police team also asked about Veewon Thokchom (President of MSAD) and Damudor Arambam (Advisor to MSAD). “They asked all his details and intimidate his family as much as possible. And it is a time when we speak too much against the arbitrary arrest of journalist Wangkhemcha Wangthoi”, the MSAD statement said. The MSAD said - Way back, MSAD’s plan to organize a protest march in New Delhi, against the arbitrary arrest of Wangkhemcha Wangthoi, was foiled by Delhi Police following the directives of Manipur CM. First in MSAD’s history, all the protestors were detained even before the Protest. Three days before the Protest, they were in search of the General Secretary impersonating themselves as TOI and Zee News reporters. Since then we have been vociferous against the state undemocratic approaches and conducts to gag the voices of the masses. He has been a strong critic against the arbitrary and conspired arrest of Wangthoi. Today, his turn has come and the state authority is using all its might to gag him. This inability to take criticism clearly shows their misconducts. “This authoritarian misuse of power and intimidation will not go long if we unite and fight back. If we don’t fight back, yesterday was Wangthoi’s turn, today is our turn and tomorrow might be your turn. We are in a sorry state of authoritarian regime that anybody can be arbitrarily arrest and kill anytime at anywhere under NSA and AFSPA, if the government does not want you. (Recently we have seen in Wangthoi’s arrest under NSA & the state inability to question the army in Gaffar’s killing). Nobody can poke nose into this draconian Acts imposed over us. We are under such state of oppression. If we don’t wake up and fight back at this right time for the mankind, justice and truth, our next generation will judge us. We were not born to be oppressed. And our silence will create more violence in future”, the statement said and added that any act of intimidation will not stay silent. A group of mediapersons today started campaigning against the arbitrary detention of Kishorechandra Wangkhem and issued a joint statement over the issue. The media persons irrespective of their affiliations to the apex journalists’ body in the state, All Manipur Working Journalists’ Union, placed on record the following points in the aftermath of the detention of Kishorechandra Wangkhem, a TV journalist previously employed with Information and Service Television Network. “We neither endorse nor encourage the expletives-filled rant and rave on social media by the now detained journalist which we feel was in bad taste. However, we would like to leave it to the wisdom of the law courts to decide whether he is liable to be sent to jail for his conduct. “Under these circumstances, we also cannot help condemning the government’s action of trampling on the fundamental rights of the TV journalist to express his opinions freely by detaining him under the draconian National Security Act, despite disagreeing with the manner in which he expressed them soon after a law court released him on bail. We strongly feel that his detention under the NSA is grossly undemocratic. The journalist has been framed on whimsical ground. Mere expletives used by an individual while criticizing a government or its representatives can never be a threat to national security. 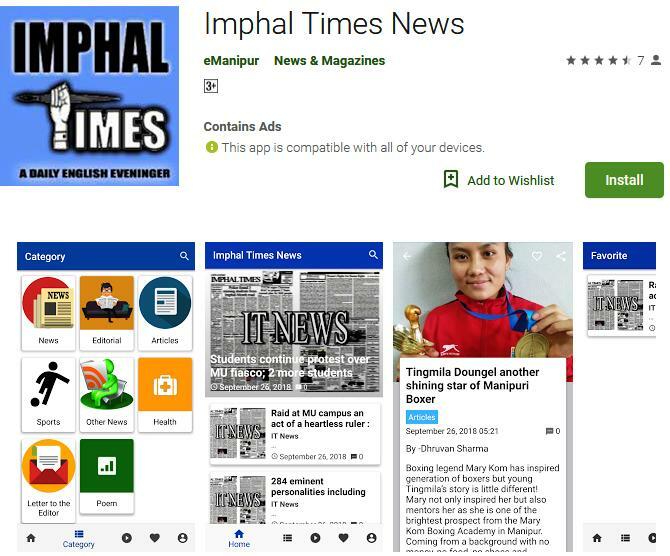 “Moreover, the decision of the All Manipur Working Journalists’ Union to distance itself from the arrested scribe by announcing that he is not a journalist and was simply a translator and anchor is extremely unfortunate. AMWJU cannot speak for all the journalists in Manipur regardless of their affiliation with it or not. In our opinion, Kishorechandra was a journalist and still remains so”, the statement said. The Regional Outreach Bureau (ROB), Imphal of Ministry of Information & Broadcasting, Government of India, today organized one day orientation workshop on Swachh Bharat Mission at its Auditorium, Imphal. The workshop was organized to sensitize the officers, officials and field functionaries of the Regional Outreach Bureau posted including officials and artists registered with ROB, Imphal. The main objective of the workshop is to update knowledge, sensitize and equip the theme of Swachh Bharat Mission (Urban) Awareness Campaign. The intensive Special Outreach Program will begin from tomorrow at five different locations. Speaking as resource person, Nepram Gitkumar, Retd. Director MAHUD said that Swachh Bharat Mission is Government of India’s Total Sanitation Campaign to improve quality of life by promoting cleanliness, hygiene and eliminating open defecation by 2nd October, 2019. And also scientifical management of solid waste in india. He lamented that as prelude to 150th birth anniversary of the father of Nation Swachh Bharat Mission was launched on 2nd October, 2014 by encouraging stakeholders to participate in improving sanitation practices. Ministry of Housing and Urban Affairs (MoHUA) has been monitoring the status of the scheme through ‘Swachh Survekshan” from the year 2016 annually. As the continuation of this monitoring mechanism the fourth survey or Swachh Survekshan will begin from 4th to 30th January 2019 to rank all the cities under Swachh Bharat Mission-Urban (SBM-U). The survey would be validated by third party certification, institutionalize existing systems through online processes and create awareness amongst all sections of society about the importance of working together towards making towns and cities a better place to live in. As citizen participation is a very important to mark and contribution for overall reduction of solid waste generated, he urged to co-operate the mission and also the surveying team. Yumlembam Lukamani Devi, Corporator Ward No. 19, Imphal Municipal Corporation stressed on the need for community participation for successful implementation of the schemes and adopt cleanliness as a mission for realizing the dream of a Swachh Bharat. K. Sonimumar Singh, A.O/DDO, ROB Imphal and Gin Gangte, Head Field Outreach Bureau, Imphal also attended the function. 54 Bn BSF under the aegis of Sector Headquarter CI Ops, Manipur Conducted Various Civic Action Programme , constructed Toilet block at Chingdompok High School and wire mesh perimeter fencing at Chingdompok Ideal Top Club at Heirok Part – II. At a function held today at Chingdompok Ideal Top Club Heirok Part –II Sh. K. Homeshwar Singh , Second – in Command of 54 BN BSF and Sh. Bharat Singh Pal , Company Commander of Heirok Company handed over the newly constructed Toilet Block and fencing of ground to the authority Chingdompok High School and Secretary of Heirok City Club Sh.M. Aboy Singh. The function was attended by local representatives, villagers, Club members and school children of Chingdompok High School . The local appreciated the goodwill gesture of BSF and expressed their gratitude and assured corporation to the BSF in maintaining peace and tranquillity in the area. The Civic action programmes were carried out under the supervision of Sh. Suneel Kumar Singh, Commandant of 54 Bn BSF. Just for an arid while. The Pune team sprung a surprise by fielding junior world championship bronze medallist Lakshya Sen for the opening men’s singles tie and the 18-year-old almost pulled off an upset against world number 35 Mark Caljouw. The youngster was solid in defence and showcased some of his trick shots but it was Caljouw who had the last laugh as he bagged the first point for Hunters 10-15, 15-12, 15-14 on the decider point. Sen kicked off the proceedings of the fourth season with a mixture of sliced drops and down the line smashes and followed them up with quick tap on the net to win points in the opening game. The Asian junior champion went into the mid game interval of the first game leading 8-6 and though Caljouw tried to fight back with an aggressive game plan, the Indian was always in control and wrapped up the game 15-10. In the second game, Sen opened up a 4-0 lead before Caljouw fought back with four straight points and then started to test the Indian’s patience by playing longer rallies. The ploy worked as he managed to win four of the next six points to open up an 8-6 lead at the midgame interval and it looked like the Dutchman would runaway with the second game when he opened up a 13-9 lead. Lakshya, however, managed to close the gap to just one point before a slip between the rally cost him the point and Caljouw wrapped up the game on the first opportunity. But the late fightback seemed to have rejuvenated Sen who raced to a 5-0 lead in the decider and changed ends with a five-point advantage at 8-3. However, it was the experience of world number 35 Caljouw that mattered the most in the final analysis as he forced the youngster out of his comfort zone and pulled the match off on the decider point by suddenly changing the speed of the rally. Pune 7 Aces then suffered a major reversal when they lost their trump match. Team skipper Mathais Boe and Chirag Shetty won the opening game but could not maintain the momentum and lost 13-15, 15-10, 15-10 against Kim Sa Rang and Bodin Isara. Boe and Shetty played well in patches but Kim came up with some exceptional shots under pressure to turn the tables to reduce the Pune 7 Aces to -1 on the points table. The experienced Lee Hyun Il wrapped up the tie for the Hunters when he defeated Brice Leverdez 15-14, 15-12 in a rather one-sided encounter. Tulihal Battalion of 9 Sector Assam Rifles under the aegis of HQ IGAR (South) organized an educational field trip for the students of Azad English School, Meitram to the leading media houses of Manipur. The trip was aimed at giving a first hand experience about news making and production in both electronic and print media. The batallion which comes under the aegis of IGAR(South) organized this field trip to the printing press of Sangai Express and Impact TV. At Sangai Express, the students were given a live demo on working various machines in tandem to produce the coluoured set that they read every morning. Students were fascinated to know that a combination of just four basic colours- Cyan, Yellow, Magenta and Black are used to produce the entire colour set. The trip to the printing press of one of the largest selling newspapers in Manipur was followed by visit Impact TV Office and their news broadcast room. The students were excited to see the large cameras and the studio room used for broadcasting the news. Raj Nongthombam, Executive Editor at Impact TV explained the importance of Media in today’s world and it being the 4th pillar of democracy. He explained the nuances of news making, how news is telecasted, the way teleprompters work, and how news is collaborated & verified before it is broadcasted. The enthusiastic students gladly took turns in sitting at the news reader’s chair and reading the news through the teleprompter. The educational field trip to these media organizations will go a long way in encouraging these students to take up journalism as a career. The students were given examples of prominent personalities like Hon’ble CM of Manipur Shri N Biren Singh who has himself served as the editor of a local daily(Naharolgi Thoudang) and as President of AMJWU. The field trip had a strong element of experimental learning by seeing the insides of media organizations and having direct contact with those who work in them. At the same time, it encouraged critical scholarly thinking. The educational trip not only inspired and encouraged students to take up journalism but also gave an insight on how media functions.The school authorities as well as the students were overwhelmed by the initiative taken by Tulihal Battalion. If the Mumbai Rockets are ready for the launch their Season 4 campaign in the Vodafone Premier Badminton League (PBL) against Delhi Dashers, Ahmedabad Smash Masters are equally upbeat about their chances against North Eastern Warriors in the first doubleheader of the fourth edition at the NSCI courts on Sunday. The gala opening preceding the clash on Saturday between new entrant Pune 7 Aces and Hyderabad Hunters notwithstanding, Mumbai Rockets are feeling at home and expect their team to do a thorough job of proving with a perfect start for them. In their efforts, they will also bank on the lung-power of the team supporters. The doubleheader would witness 30 tough matches with each contest having five ties, guaranteeing a grand feast for the Sunday crowd that is expected to flock into the stadium. Mumbai Rockets, who have a good mix of Indian and foreign players, including Beijing Olympics champion in mixed doubles, Korean shuttler Lee Yong Dae, and they will look forward to carrying their form in their last meeting against the Dashers in the previous edition when they beat them 4-1. The highest paid Korean, who has been the pillar of strength for the last two seasons with Rockets, sounded confident about a good start to their campaign tomorrow. “We start our season from Mumbai and I am really looking forward to it. I have been associated with the Mumbai franchise for the past two seasons and I am confident of a good outing this year, especially with a strong team to back us in doubles and men singles, our mainstay,” said Lee. Equally upbeat was the H.S. Prannoy led Delhi Dashers who felt that their strength lay in a combined effort of the team, with Tommy Sugiarto. “We are playing in Mumbai against the home team. The pressure will be equal for both teams despite the crowd supporting the Rockets,” said Prannoy. The talent-oozing North East Warriors, with London Olympics bronze medallist Saina Nehwal as its spearhead, have a tough task at hand when they take on Ahmedabad Smash Masters in the late evening clash of the day. The experienced Saina, who got married recently to P. Kashyap, would want to begin with a clean slate in the new season with a new team and for that she would largely depend on the decent mix of experience and talented team, Additionally, the motivation for them would be to avenge the narrow 3-4 loss they suffered at the hands of Smash Masters in the last edition. The Ahmedabad franchise, on the other hand, would want to carry the psychological edge they have against NEW. But they are, apart from Saina, relying on the combination of Yoo Yeon Song and Kim Ha-na to provide win in the doubles and Tian Houwei in singles attack. “I am really happy with the team we have, it is a good mix of experience and talent. We have Yoo Yeon Song and Kim Ha-na in the doubles department and Tian Houwei in singles. I am sure we will put up a strong display and play like the real Warriors,” said a confident Saina. Ahmedabad’s Viktor Axelsen, the only player to have a cent percent record with the highest number of trump matches (3) in the previous edition, knows the significance of giving his team a strong opening with all tenacity. “It’s important to start strong and stick with your winnings ways, especially when you are playing a league. We have shaped up a competitive squad and have requisite firepower in our attack. NE Warriors, too, have some of the finest shuttlers and this surely will be a keenly-contested tie. But we would like to take one match at a time with a positive start to our PBL4 campaign tomorrow,” said Axelsen.